Once part of the milk train that carried churns to Somerset dairies, Gabriel’s Wagon retired to Happy on the Hill and has been lovingly restored by a great team of craftsmen. They have worked to provide comfort, tranquility and fun for a couple to stay amidst its rolling fields and heart-stopping views all the year round. Think of the ‘Little House on the Prairie’ plus a few touches of luxury that will make you smile! You will find a big comfy bed one end with luxuriously soft bamboo bed linen and at the other end - a beautifully crafted kitchen area. 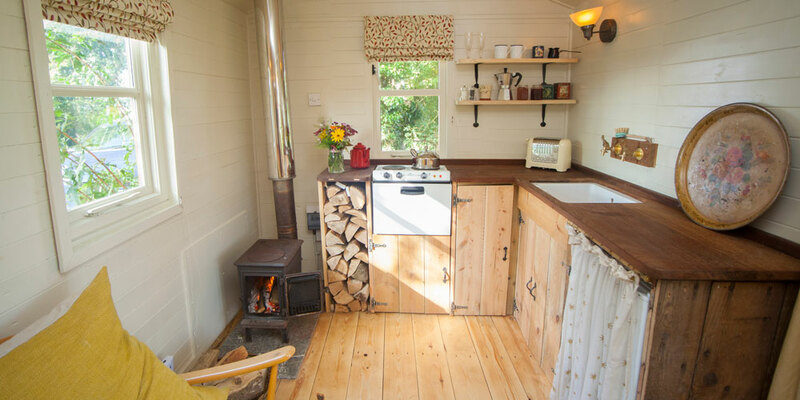 Gabriel’s Wagon has running hot and cold water and electricity and is properly equipped with kitchen utensils, cutlery, crockery, a baby belling hob and oven, Belfast sink and little fridge. There is a sweet wood burning stove that lights like a dream and keeps the wagon in constant warmth when needed, scenting the outside air with its gentle wood-smoke. Sink into the deep feather cushions of the old Ercol sofa and open the French windows to enjoy the view down to the little village church in the valley below. 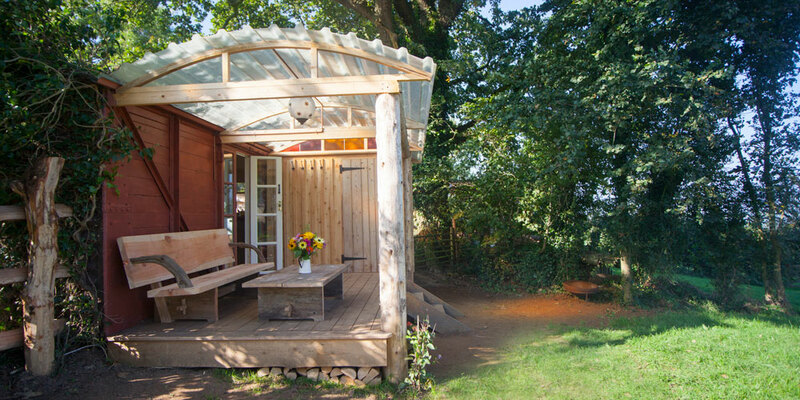 Undercover of the translucent arched roof, walk out onto the red cedar and larch decking. At one end an old pine door leads to the bathroom that invites you to relax! Enjoy the treat of a cast iron roll-top bath filled with hot running water and privacy to open the door wide if you fancy, to enjoy the view as you let go of all life’s demands. 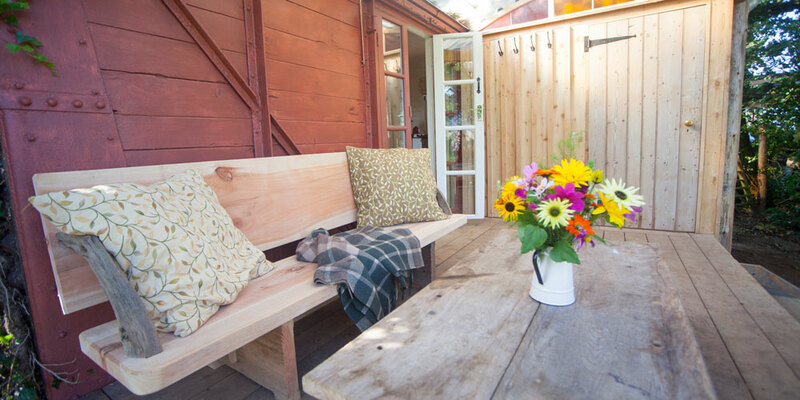 On the verandah there are flourishes of craftsmanship that give Gabriel’s Wagon its unique quality: insets of stained glass, a mighty restful bench made out of cedar with bone oak arm rests and table made from upcycled wood. Beneath the deck the logs for the wood-burning stove are neatly stored. Down the wooden steps, in front of the wagon is a fire pit and fire wok if you wish to cook outside and enjoy the spectacular lookout spot by day and the clear starry sky by night, accompanied by the hoots of our owls. The owners, Susan and Neil who have lived here for 21 years have a plentiful organic garden and orchard. Your stay will come supplied with simple breakfast ingredients - all local produce: Happy on the Hill Jams, marmalade, apple juice and eggs, Bruton Dairy milk; At the Chapel bakery bread and Gilcombe Farm butter. A bottle of Bullbeggar cider from apples grown in Lamyatt village will help to ease you into your break! Susan and Neil will leave you to enjoy your stay in peace, but are on hand should any help be needed.